Club Tijuana Xoloitzcuintles de Caliente is here to stay. This professional soccer team has a rich history filled with memorable anecdotes that make it an interesting story within Mexican soccer. Club Tijuana Xoloitzcuintles de Caliente was founded in 2007 and five years later, the hairless Pre-Hispanic dogs became champions of Mexico’s top circuit after an unprecedented run during the 2012 Apertura. The Xoloitzcuintles, under Coach Antonio Mohamed, beat CD Toluca in the LIGA MX championship final with a 4-1 aggregate score to become the youngest franchise to win a Mexican title. Club Tijuana needed a 2-1 win at home in the first leg of the home-and-home series and a 2-0 win in Toluca to seal the Club’s first Liga MX championship. The Xoloitzcuintles reached this milestone after spending only three tournaments in the country’s top league. And it did it with style, finishing the regular season tournament as the No. 2 seed behind Toluca, with both teams earning 34 points but Toluca having the tiebreaker with a better goal difference. Club Tijuana finished as one of the best defenses in the league that included a 17-match unbeaten streak at Estadio Caliente.. The successful outing in the regular season earned the Xoloitzcuintles a direct slot into the 2013 Copa Libertadores, South America’s prestigious tournament. It also helped Club Tijuana land a spot in the 2013-2014 CONCACAF Champions League, a tournament contested by teams from North and Central America and the Caribbean. It was a 2012 Apertura to remember and one that will stand out in Xoloitzcuintles history. And the history continued with the Copa Libertadores in 2013 under Coach Mohamed. The Xoloitzcuintles participated in the South American tournament, broadcasted in more than 150 countries, for the first time in its short history. Club Tijuana didn’t disappoint, making it to the knockout rounds with a second place finish in Group 5 with 13 points. The Xoloitzcuintles made more history during the group stage with wins against Millonarios of Colomnia, San Jose de Oruro of Bolivia and Corinthians of Brazil, moving on to the Round of 16. The success continued as Club Tijuana beat Palmeiras of Brazil with a 2-1 aggregate score to reach the quarterfinals. It was there where the magical journey ended with a 3-3 tie on aggregate against eventual champion Atletico Mineiro. The Brazilians won the quarterfinals series with the 2-1 away goal tiebreaker advantage. The international success continued with the 2013-2014 CONCACAF Champions League tournament. Club Tijuana made its debut in this tournament with a scoreless draw against L.A. Firpo of El Salvador Aug. 6, 2013. The first win in this competition came 14 days later when the Xoloitzcuintles beat C.D. Victoria of Honduras 3-2. The Xoloitzcuintles went on to win Group 7 with 10 points, qualifying to the quarterfinals home-and-home series under Coach Jorge Almiron. Club Tijuana would be matched up against Major League Soccer’s Los Angeles Galaxy in that round but this time under the tutelage of Venezuelan coach Cesar Farias. The Xoloitzcuintles went on to beat the Galaxy with a 4-3 aggregate score in an exciting home-and-home series. 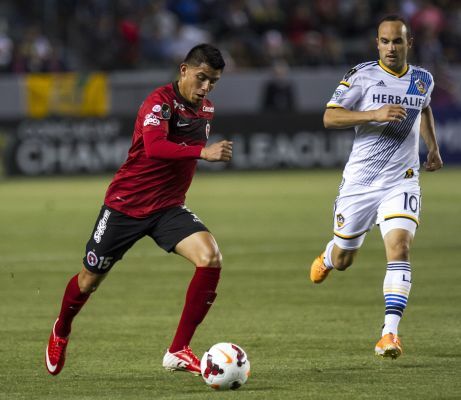 The Galaxy beat Club Tijuana 1-0 in the first leg in Los Angeles. But the Xoloitzcuintles answered back with a 4-2 win at Estadio Caliente to move on to the semifinals. Club Tijuana was a goal from reaching the CONCACAF Champions League final. Cruz Azul eliminated Farias’ team with a 2-1 aggregate score. The Xoloitzcuintles beat the Mexico City team 1-0 in the first leg at Estadio Caliente. Cruz Azul held on to a 2-0 lead in the second leg despite Club Tijuana pressuring and sending a barrage of shots late in the match. Another important chapter in the team’s history concluded. Playing in these international competitions would be as important as the work done at home. That includes earning a promotion from the Liga de Ascenso or Second Division in 2011 will also stand out. 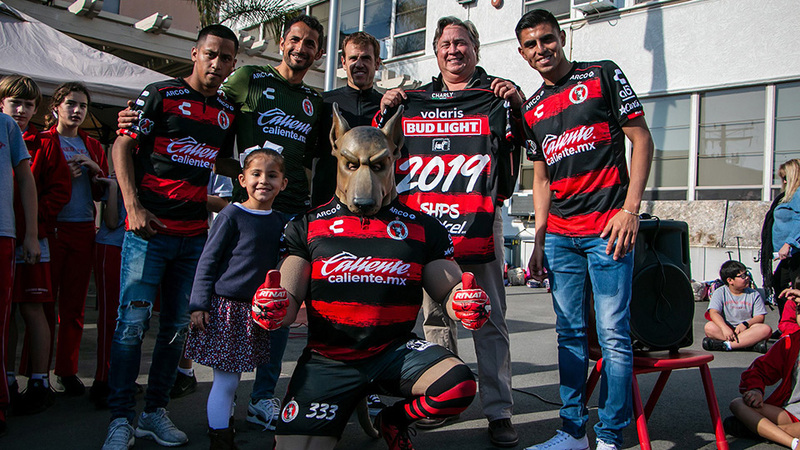 The team reached the First Division in May of 2011 under a plan heads by Club President Jorgealberto Hank Inzunza and Vice President Gog Murguía who plan to keep Tijuana as a First Division city. From the beginning, the Club Tijuana project was created with a solid base. Proof to that beginning is the construction of Estadio Caliente and the creation of a youth soccer system. The team began functioning as a club at the community sports complex known as the CREA de Tijuana. The youth clubs have shown encouraging growth within Xoloitzcuintles territory as they compete in the Under-13, U-17 and U-20 national tournaments as well as the Third Division. 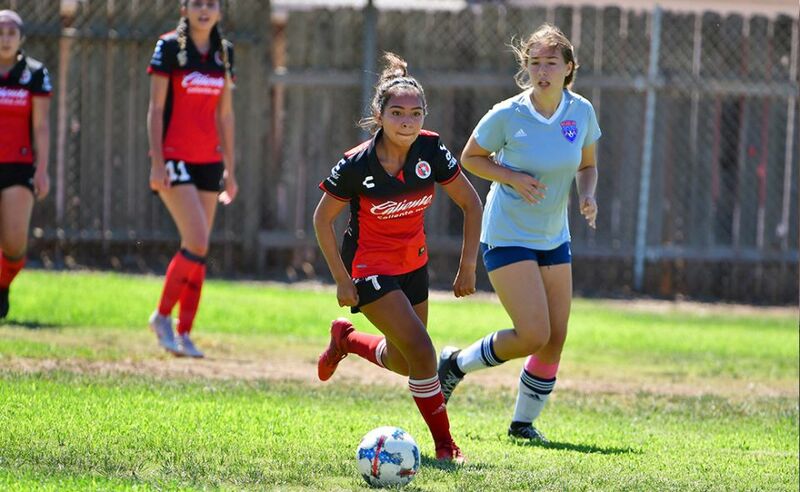 The Club Tijuana youth clubs also have international experience as they have competed in events such as the “2011 Future Champions of Belo Horizonte Brazil,” and a tour through Argentina that same year. The Under-17 team went on to win the Future Champions tournament in South Africa in 2013, beating some of the top club reserve teams in the world. The Under-17 team reached the semifinals in 2014, repeating another standout showing in that tournament. These tournaments are part of the work that will bring us the Xoloitzcuintles of the future. The opening of the Centro de Iniciacion Xoloitzcuintles, known as the CIX, has become a significant accomplishment for Club Tijuana. 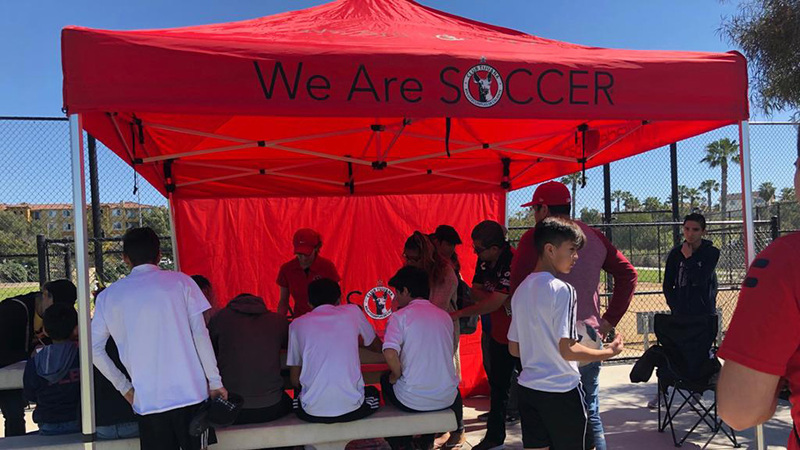 The youth soccer school counts with more than 500 students, which helped motivate the club to open other academies in the region including one in Rosarito, Ensenada and in California (Chula Vista, Temecula and Ventura). The academies in the United States have more than 300 enrolled kids competing in some of the country’s top leagues. Another pillar in the Club Tijuana project is the National School of Head Coaches Xoloitzcuintles Campus, which has generated a number of new coaches that have a shot at having a career within Mexican soccer. The Xoloitzcuintles earned its first championship in the 2010 Apertura tournament of the Liga de Ascenso. Club Tijuana beat Tiburones Rojos de Veracruz in the tournament final with a 3-0 aggregate score. Mauro Gerk, Javier Gandolfi and Raul Enriquez scored for the Xoloitzcuintles. Enriquez’ goal came at Estadio Caliente. Club Tijuana reached the Final of the 2011 Clausura the following tournament, looking for an automatic berth and promotion into the First Division. But the Xoloitzcuintles lost to Irapuato 2-1, forcing the club to play in a promotional playoff between both teams. The Xoloitzcuintles went on to beat Irapuato under coach Joaquin del Olmo. The Xoloitzcuintles learned that things would not be easy while spending nine tournaments in the Ascenso Division (Mexico’s Second Division). The team spent six postseasons vying for a slot in Mexico’s top flight league until the team reached that objective on May 21, 2011, one of Club Tijuana’s more memorable dates. Mexican-American Joe Corona, a youth system product, and Argentine-born striker Mauro Gerk both scored for the Xoloitzcuintles in that match at Estadio Caliente in front of an always-loyal crowd. 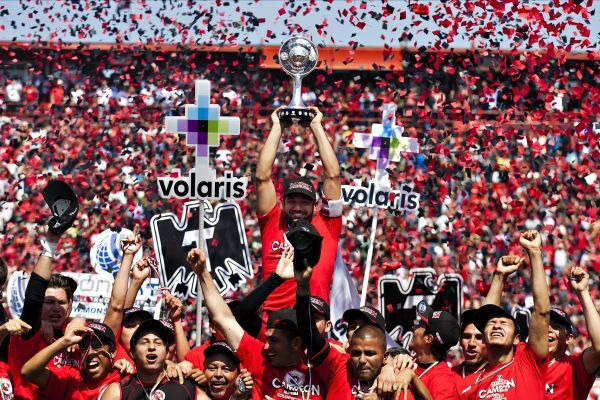 The 2012 Apertura title is a memorable accomplishment for Club Tijuana but there were others in its short existence in the First Division. The team completed a memorable 2012 Clausura tournament in which it reached important goals. That helped keep the team on track to achieve excellence as it assimilated to the First Division, a fundamental goal to the project. The team’s history in the First Division has been a road filled with unique anecdotes that mark the Xoloitzcuintles sentiment. The team played in its initial First Division match June 23, 2011 against Monarcas Morelia at Estadio Caliente. Joe Corona scored the team’s first goal for the Xoloitzcuintles as members of the First Division. The numbers and statistics are clear. Results have been positive after the club’s first year in the top-flight league. The team avoided relegation after only 29 games in the First Division under Coach Antonio Mohamed. That goal was reached on March 24, 2012 in a Week 12 match of the 2012 Clausura against Atlas de Guadalajara. The Xoloitzcuintles agenda now includes trying to keep growing as an institution and become a powerhouse team within the league. Jorgealberto Hank Inzunza and Gog Alberto Murguía Fernández are the team’s presidency, making it one of the youngest front office in soccer. Even after obtaining championships and reaching the playoffs, the team’s front office remains true to its philosophy, taking it step-by-step. It is the same essential philosophy that has helped it become a solid team and earned respect within Mexican soccer. Qualified to the 2013-2014 CONCACAF Champions League tournament. The Xoloitzcuintles has also become well-known at an international level thanks to its participation in the 2013 Copa Libertadores and 2013-2014 CONCACAF Champions League. But it has also become a popular commodity in the United States, particularly in the Southwest. The team from Tijuana has four San Diego Clasico titles, an annual match played in California. The first San Diego Clasico win came March 2, 2011 after beating Major League Soccer’s Los Angeles Galaxy in penalty kicks (4-3) after playing to a 2-2 draw in regulation at University of San Diego’s Torero Stadium. Club Tijuana repeated as champion February 22, 2012 after beating Chivas USA 5-2, also at Torero Stadium. The Xoloitzcuintles faced Club America in its third San Diego Clasico, this time playing to a 1-1 draw at Qualcomm Stadium in San Diego. Club Tijuana went on to win a fourth San Diego Clasico July 6, 2013 with a 5-2 victory against Club America who was coming off a 2013 Clausura title. This time, the Xoloitzcuintles beat Las Aguilas at Major League Baseball stadium Petco Park in front of more than 29,000 people. The Xoloitzcuintles also went on to play in the first Los Angeles Clasico Dec. 28, 2013 at the Stub Hub Center in Carson, Calif. where it overcame a first half deficit to tie 3-3 with Club America. Club Tijuana has also played outside of California as it played in the Battle of Champions against Santos Laguna in a friendly in San Antonio, Texas in October 2013. And the story continues. The Xoloitzcuintles want to write the next chapter through professional soccer with gold letters. LET’S GO XOLOS, LET’S GO FOR MORE!! !